Add as many steps as you want to your sequencer. Assign chords or notes in any scale and a key or create your custom notes. Edit rate, gate time, velocity, modulation, pitch bend, portamento and repate count of each step. Select your scale and your key to work with. 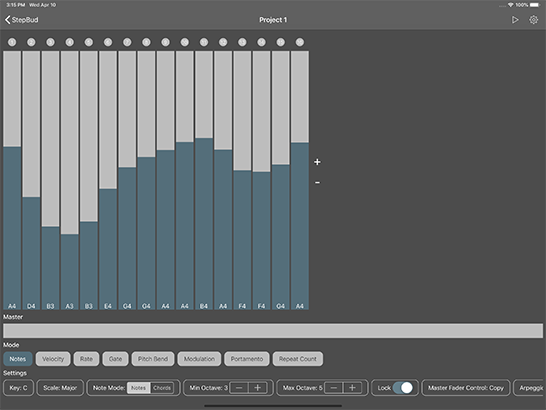 You may change sequencer mode from single notes to chords. Your faders range will be automatically updated to the selected scale, even if you are already sequencing it will update immediately. You may adjust your faders range by setting the minimum - maximum octaves from the settings strip. In chord mode, your faders range will be updated by the chords in the scale you are working in with triads, 7th, 9th, 11th and 13th variations. You can set custom notes or chords for any of your step. In that mode, you can work with the virtual keyboard or even your own MIDI keyboard. You can select a different scale or a key other then the sequencer's scale. You can quickly pick notes or chords in the scale you selected. You can see your selected notes and even listen them if you press the Preview button. Use it in supporting hosts like AUM, Audiobus 3, Cubasis 2, Beat Maker 3, apeMatrix and Sequencism. Route its MIDI to other AUv3 Synths. 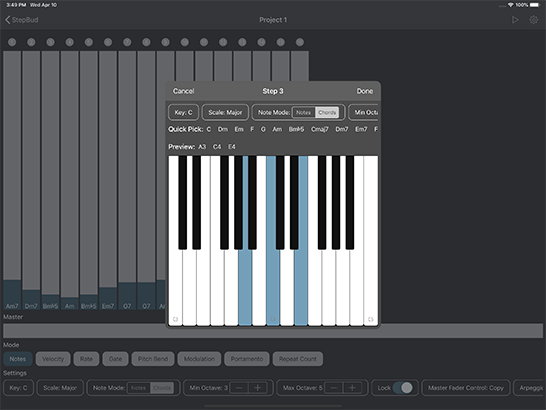 Route your MIDI Keyboard's or other MIDI app's MIDI Out to ScaleBud for always playing in scale. In chord mode, ScaleBud will play chords, if any available in the scale you're working in for the root note you are sending. You can use it in the Audiobus 3 as a MIDI Sender. In that mode, you can sequence the connected app. Also, you can use Ableton Link for being in sync with the other supporting apps. 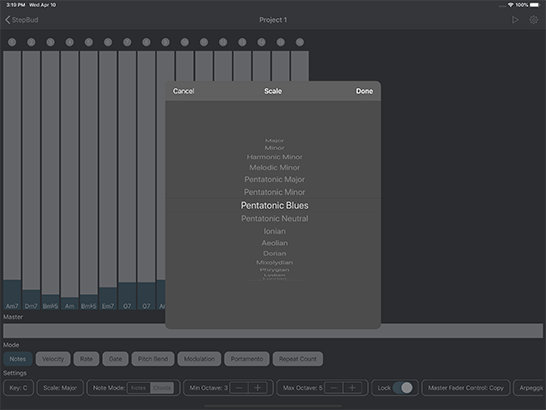 In that mode, it will filter out off-scale notes in scale mode, and sends the chords in chord mode. StepBud offers its core componets on Github. 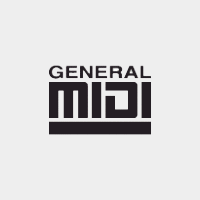 Send and receive MIDI in human language with Swift enums. @IBDesignable Horizontal or vertical UIControl subclass that can start from bottom or middle of the control.